Non-melanoma skin cancer is the most common type of cancer in the world. The two most common types of non-melanoma skin cancers are basal cell carcinoma (~80%) and cutaneous squamous cell carcinoma (~20%) [1,2]. It is difficult to know the true incidence of non-melanoma skin cancers as very few cancer registries worldwide maintain statistics on these cancers [1,2]. According to the Canadian Cancer agency, it is estimated that there will be 81,300 new cases of non-melanoma skin cancer in Canada in 2012, with 320 deaths . Despite the low rate of mortality from these cancers, they demand treatment. Australian statistics indicate that the incidence of treated non-melanoma skin cancers is more than 5 times the incidence of all other skin cancers combined . Epidemiologic studies have revealed patterns common to both basal cell carcinoma (BCC) and cutaneous squamous cell carcinoma (cSCC). Both BCC and cSCC have higher rates of incidence in populations located closer to the equator. Incidence also increases exponentially with age, although cases of BCC before age 40 are becoming more frequent. Additionally, both BCC and cSCC are significantly more frequent in light skinned populations than darker skinned individuals [1,2,4,5,6]. By far the biggest risk factor for both BCC and cSCC is UV light exposure [1,2,7,8]. UV light is divided by wavelength into three subtypes: UVA (320-400nm), UVB (290-320nm) and UVC (200-290nm). It is estimated that 95% of UV rays that reach the earth are UVA, with the vast majority remaining being UVB rays. UVC rays do not reach the earth’s surface in appreciable amounts, as they cannot pass through the ozone layer . The depth of UV light penetration through the skin is proportional to its wavelength. It is estimated that 20-30% of UVA rays penetrate to the deep dermis. Conversely, only 10% of UVB rays penetrate to the superficial dermis (see image) . 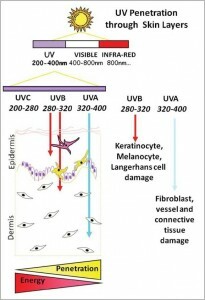 Traditionally it has been thought that UVB is responsible for carcinogenesis, while UVA exposure results in other effects such as photoaging. UVB is absorbed directly by DNA, ultimately leading to mutations in the tumor suppressor gene p53. However, there is increasing evidence that UVA also contributes to carcinogenesis. It is hypothesized that UVA indirectly alters DNA through the creation of reactive oxygen species [7,8]. Although UV light exposure is a major risk factor for both BCC and cSCC, there is a difference in the timing of exposure that produces the risk of carcinogenesis. BCC is associated with childhood sun exposure, whereas cSCC is associated with chronic sun exposure in the 10 years prior to diagnosis [5,6,7]. Chronic arsenic exposure has been shown to lead to both cSCC and BCC [1,2]. Arsenic exposure can be as a result of occupational exposure or environmental exposure, such as drinking contaminated water or eating contaminated food. Evidence suggests that BCC occurs 30-40 years after exposure . Studies have demonstrated that ionizing radiation also increases the incidence of both BCC and cSCC, with a higher risk of BCC development [1,2]. Ionizing radiation is used for a variety of therapeutic purposes, including the treatment of acne and cancer. The risk of developing a non-melanoma skin cancer increases with increasing dose of radiation and when it is delivered over sun exposed areas of skin . Chronic immunosuppression is another risk factor for non-melanoma skin cancer, particularly cSCC [1,2]. Studies from Europe indicated that patients who received heart and kidney transplants were 65-250 times more likely to develop a cSCC than the general population [1,2,4]. The pathogenesis of this risk is complex and likely relates to the inability of the skin to repair the damage caused by UV rays . Approximately 1% of skin cancers occur in chronically inflamed skin, with the vast majority of these being cSCCs . There is increasing evidence that lifestyle factors may play a role in the pathogenesis of non-melanoma skin cancers. It is known that smoking leads to an increased risk of cSCC and it may be contributory in BCC as well. The potential risks and/or benefits of other dietary and social factors are also currently being investigated [1,2,4]. In addition to environmental risk factors, there are genetic disorders and polymorphisms that increase susceptibility to non-melanoma skin cancers [1,2,4]. Xeroderma pigmentosa (XP) is an autosomal recessive disorder that leads to an increased risk of both cSCC and BCC. The genetic defect associated with XP manifests as a defective DNA repair mechanism to UV radiation leading to increased sun sensitivity . It is estimated that the rate of skin cancers in this population before age 20 is 2000 times the rate of skin cancer in the rest of the population . 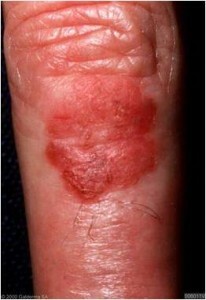 Epidermolysis bullosa is a group of syndromes that are characterized by blister formation in response to minimal injury. Certain subtypes of this condition increase risk for both BCC and cSCC. The cSCCs that arise in patients with these syndromes are extremely aggressive, with a 80% mortality rate . Basal cell nevus (Gorlin’s) syndrome is an autosomal dominant disorder that arises due to mutations of the human patched gene. It is characterized by developmental anomalies and multiple BCC’s developing at a young age (between age 2 to 35). There are other characteristic clinical features associated with this syndrome [1,2,4]. Other genes have been implicated in the pathogenesis of cSCC and BCC. These include the p53 tumor suppressor gene, polymorphisms in the glutathione-S-peroxidase enzymes and melanocortin-1 receptor. The role of these genes is the subject of much current research [1,2,4]. Use broad spectrum, water resistant sunscreen with an SPF factor of at least 30. Sunscreen impedes UV radiation from penetrating through the skin’s layers. The use of sunscreen has been proven to decrease the risk of actinic keratoses (the precursor lesion for cSCC) and cSCC. The evidence is inconclusive as to the impact of sunscreen on BCCs . A handout for patients on the proper use of sunscreen can be found by clicking here . There is evidence that certain dietary factors may play a role in preventing non-melanoma skin cancers, including: low dietary fat intake and high antioxidant intake. However, these results have not yet been supported by large studies and thus cannot be used to inform dietary choices . To date, Canada has not set out screening guidelines for non-melanoma skin cancer in the general population. Australian practice guidelines suggest that skin cancer screening should be a routine part of the annual check-up. Early detection of non-melanoma skin cancers can reduce morbidity and mortality as well as the costs associated with treatment . The most important part of the clinical assessment for skin cancer is the physical examination. Examine the calves, posterior thighs, buttocks, and back. It is important to ensure complete visualization of any lesion in order to give a thorough description. Every skin lesion should be described noting the following features: location, type, colour, shape, arrangement, distribution, consistency and feel. 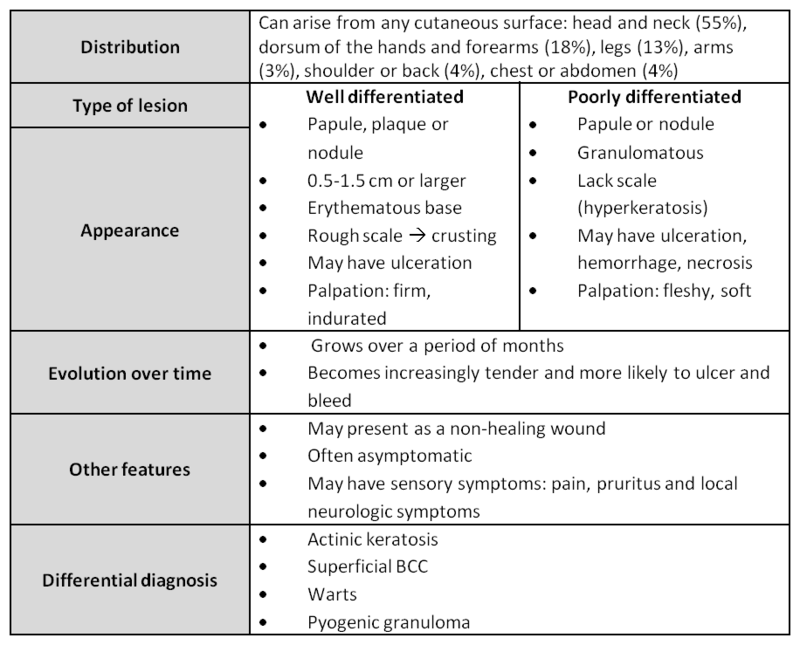 The two most useful characteristics in terms of forming a differential diagnosis are the type and distribution of lesions. Palpation of the lesion can reveal scale and tenderness. Stretching the skin around the lesion can help expose distinguishing features . 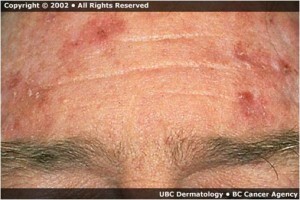 BCCs are cancers that arise from the non-keratinizing cells of the basal layer of the epidermis. There are three major subtypes of BCC: nodular (~60%), superficial (~30%) and morpheaform/sclerosing (~5-10%) . These subtypes can usually be distinguished from one another based on their appearance (see Signs and Symptoms module). Pathologic evaluation confirms the diagnosis and subtype of BCC. BCCs appear histologically as nests of basaloid cells with hyperchromatic nuclei and scanty cytoplasm within the dermis. Most BCCs have peripheral nuclear palisading. Pigmented BCCs contain melanin . cSCCs are cancers of the keratinocyte, which is the major cell type of the epidermis . cSCC’s can arise spontaneously, however at least 60% of them arise from actinic keratoses (AK). It should be noted, however, that <1% of AKs become cSCCs . cSCC’s can be subdivided into cutaneous squamous cell carcinomas in situ (bowen’s disease) and invasive squamous cell carcinomas . These lesions do have characteristic clinical features (see Signs and Symptoms section), however they can only be definitively distinguished histologically. All three of these lesions show nuclear atypia of the keratinocyte . Additionally all may show hyperkeratosis, which produces the rough scales seen clinically. Actinic keratoses and cSCC in situ are distinct from invasive cSCC in that only invasive cSCC penetrates from the epidermis into the dermis [2,3]. Non-melanoma skin cancers vary in their appearances and presentations. Clinical examination plays a key role in determining management of skin lesions, thus it is essential to be able to recognize and distinguish between benign skin lesions and non-melanoma skin cancers. It is beyond the scope of this module to describe the features of benign skin lesions; however, students should familiarize themselves with these. Basal cell carcinomas can be divided into 3 subtypes: nodular, superficial and morpheaform . Any of these subtypes can present in a pigmented form. In this case they must be distinguished from malignant melanoma . The common presentation of each of these subtypes will be described below. The most important part of the clinical assessment for skin cancer is the physical examination. Students should review the approach outlined in the screening module. It is important to note that cSCCs metastasize in 1-5% of cases [2,4]. The most common locations for metastasis are to the local lymph nodes. As such, the regional lymph nodes should be examined any time that a lesion is suspicion for cSCC [4,5]. A full body skin examination should be performed anytime an examination of a single skin lesion is done. This aids not only in characterizing the distribution of lesions, but it provides the opportunity to screen for other skin lesions . The choice of which biopsy technique to use is dependent on the clinical situation and the judgment of the treating physician [4,6]. 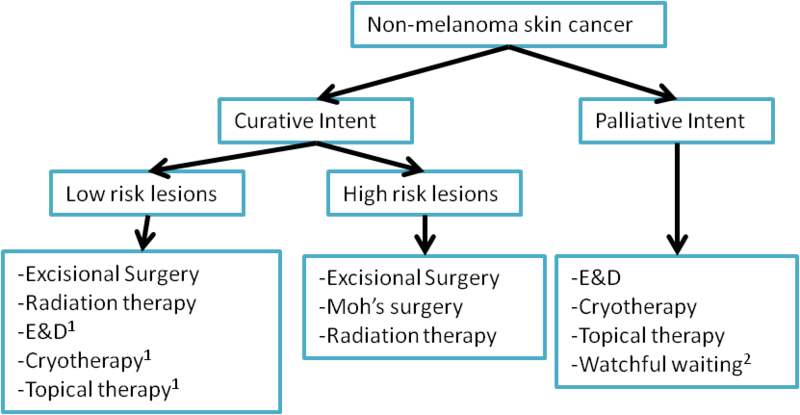 Consideration should be given to choosing a technique that will provide the maximal information regarding the skin cancer and its prognosis, and insight into the optimal treatment modality. For instance, an excisional biopsy may be preferable with small lesions where the clinician suspects that excision may be curative. For lesions that are suspected to be malignant it is preferable to use either an excisional or punch biopsy in order to determine the depth of the lesion . There are no laboratory tests that play a role in the diagnosis of non-melanoma skin cancers [2,3,5]. Imaging is seldom used in the diagnosis of non-melanoma skin cancers. 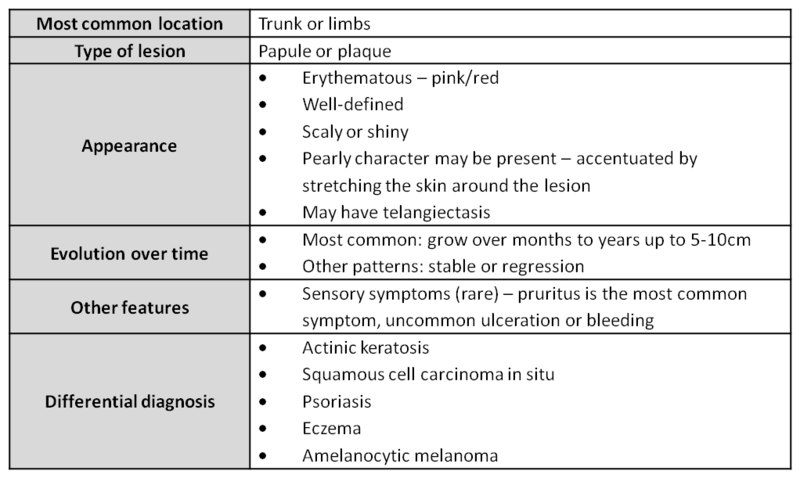 In rare cases when the lesions are large and it is difficult to determine the lesion’s depth an ultrasound, CT or MRI can be ordered [4,5]. Imaging may also be used to determine the stage of disease (see Staging). In the aforementioned TNM system, imaging is necessary to establish the “N” and “M” stages. However, imaging is not performed on the majority of patients with BCCs or cSCCs because only 1-5% of cSCCs and <0.1% of BCCs metastasize [2,3]. That being said, it is important to note that despite the low rate of mortality incurred by these cancers, there can be significant morbidity. BCCs can be extremely locally destructive to tissues and bones despite being low grade . There is no definitive consensus as to how to determine which patients should be imaged. Experts agree that the TNM system is inadequate, as the vast majority patients have T1N0M0 disease and they do not all have the same prognosis [2,5,6]. As such, most guidelines suggest that tumours should be classified as either “high risk” or “low risk” according to their potential for metastasis [2,5,6]. These defining features are not standardized, however, the high-risk features typically increase the 5-year recurrence rate and/or metastatic rate over 15% . As it is exceedingly rare for BCCs to metastasize, there is no standardized approach for imaging high risk BCCs. BCCs that do metastasize most commonly spread to the local lymph nodes, lung and bone . The protocol for imaging cSCCs is much more established than that for BCCs because of their higher rate of nodal spread and metastasis. cSCCs most commonly spread to regional lymph nodes, however they can also metastasize to the lung, liver, bone and brain . Patients with palpable lymphadenopathy must undergo a lymph node biopsy to establish whether there is evidence of disease in the palpable node. The biopsy is typically conducted using a fine needle aspiration technique. 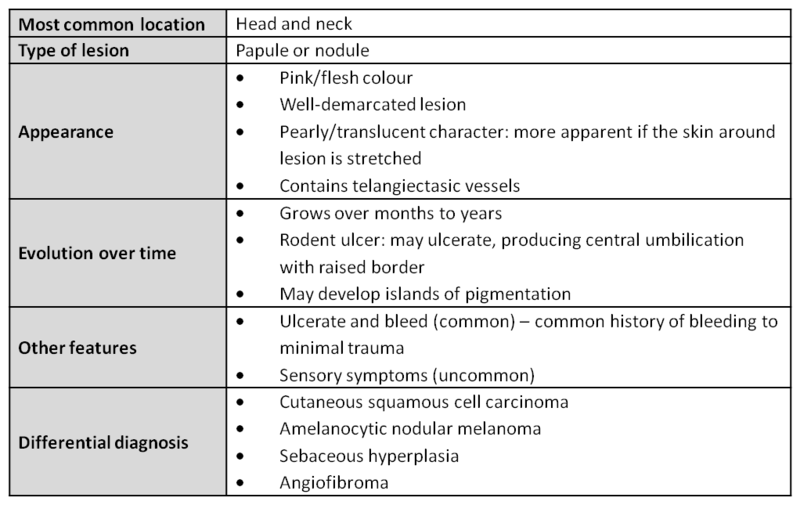 If the cytology confirms that the node is positive for disease, the patient should undergo imaging tests to characterize the extent of nodal involvement. If the cytology does not indicate that there is disease in the palpable lymph node, the physician should consider whether the tumour is “high-risk”. Physicians may decide to send patients with sufficient high-risk features, with or without palpable lymphadenopathy, for imaging of the regional lymph nodes. The most common imaging modality used for staging nodal involvement is CT. Other imaging techniques that may be considered are MRI, PET and ultrasound [2,3]. Patients with confirmed nodal involvement and/or extremely high-risk disease may undergo full-body imaging for distant metastases. The options for full-body imaging include CT, PET and PET-CT. The gold standard is currently unknown . The prognosis for nonmelanoma skin cancers is extremely good in most cases with a greater than 95% disease free survival at 5 years for low stage disease . However, this prognosis changes considerably for high-risk lesions with rates dropping down below 50% for T4 lesions . This underscores the importance of properly staging nonmelanoma skin cancers. 1 - E&D, cryotherapy and topical therapy are used in select cases when lesions are of low risk (including low metastatic potential) and slow growing. These treatments typically slow disease progression but may not be fully curative and lesions may recur. 2 - Watchful waiting may be suitable for lesions which are slowly growing or in cases where patients have multiple comorbidities exceeding the risk of their cancer. Follow-up of non-melanoma skin cancers is essential in order to monitor for disease recurrence, metastasis and the presence of new skin cancers. The protocol for follow-up, as laid out by the BC Cancer Agency, differs according to the type of cancer . Any patient with disease recurrence should be referred to a dermatologist or to the cancer agency for further treatment. 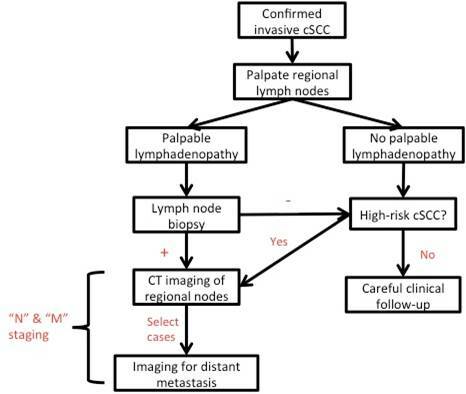 The follow-up for patients with a cSCC depends on whether the tumour was high or low risk. For low-risk disease it is suggested that patients undergo a full body skin examination and a regional lymph node assessment annually for at least 5 years. It is suggested that this approach is continued past the first 5 years as well. This case study was designed to supplement your knowledge on the workup of non-melanoma skin cancer and test what you have learned after going through module. Use your mouse to click through the slides and answer each question in the text box provided. Lim, J.L., & Asgari M. (2012). Epidemiology and risk factors for cutaneous squamous cell carcinoma. In: Basow, D.S. (Ed. ), UptoDate. Waltham, MA: UptoDate. Stern, R.S. (2012). Epidemiology and clinical features of basal cell carcinoma. In: Basow, D.S. (Ed. ), UptoDate. Waltham, MA: UptoDate. Canadian Cancer Encyclopedia: Canadian Cancer Society. Statistics for non-melanoma skin cancer overview. Retrieved from: http://info.cancer.ca/cce-ecc/default.aspx?Lang=E&toc=47&cceid=1377. Accessed July 25th, 2012. 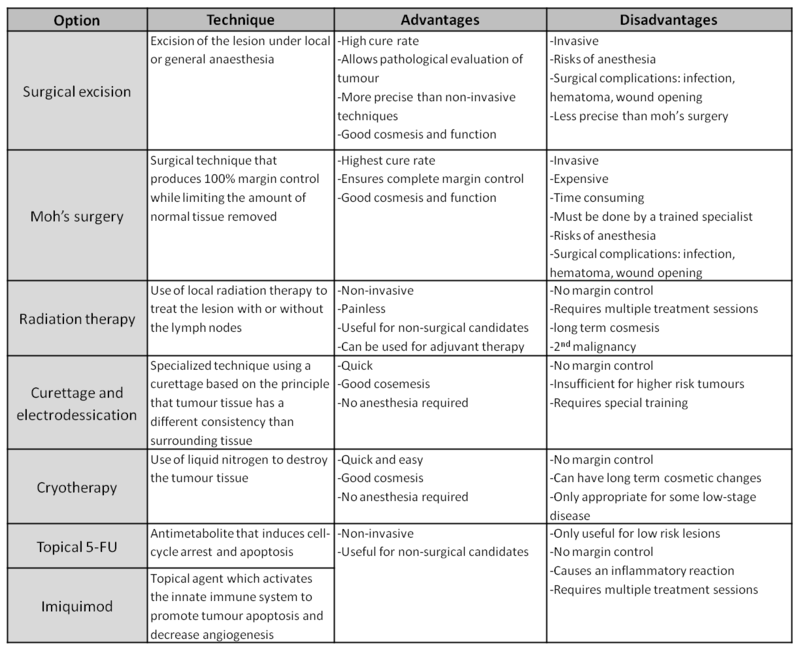 Basal cell carcinoma, squamous cell carcinoma (and related lesions) – a guide to clinical management in Australia. Cancer Council Australia and Australian Cancer Network, Sydney, 2008. Gallagher, R.P., Hill, G.B., Badjdik, C., Fincham, S., Coldman, A.J., McLean, D.I., & Threlfall, W.J. (1995). Sunlight Exposure, Pigmentary Factors and Risk of Nonmelnocytic Skin Cancer: I. Basal Cell Carcinoma. Archives of Dermatology, 131(2), 157-63. Gallagher, R.P., Hill, G.B., Badjdik, C., Coldman, A.J., Fincham, S., McLean, D.I., & Threlfall, W.J. (1995). Sunlight Exposure, Pigmentary Factors and Risk of Nonmelnocytic Skin Cancer: II. 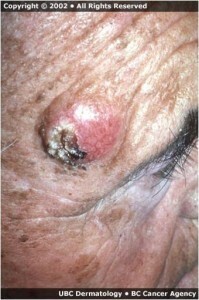 Squamous Cell Carcinoma. Archives of Dermatology, 131(2), 164-69. Jou, P.C., Feldman, R. J., & Tomecki, K.J. (2012). UV protection and sunscreens: What to Tell Patients. Cleveland Clinic Journal of Medicine, 79(6), 427-436. doi: 10.3949/ccjm.79a.11110. ‍Basal cell carcinoma, squamous cell carcinoma (and related lesions) – a guide to clinical management in Australia. Cancer Council Australia and Australian Cancer Network, Sydney, 2008. Geller, A.C, & Swetter, S. (2012). Screening and early detection of melanoma. In: Basow, D.S. (Ed. ), UptoDate. Waltham, MA: UptoDate. Internet Curriculum for Melanoma Early Detection group. (2011). INFORMED Skin Cancer Education Series. 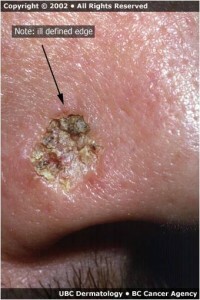 Retrieved from: http://www.skinsight.com/info/for_professionals/skin-cancer-detection-informed/skin-cancer-education. ‍Stern, R.S. (2012). Epidemiology and clinical features of basal cell carcinoma. In: Basow, D.S. (Ed. ), UptoDate. Waltham, MA: UptoDate. ‍UiCC International Union against Cancer. (2010). Skin Tumours. In: Sobin, L., Gospodarowicz, M., & Wittekind, C. (Eds.). 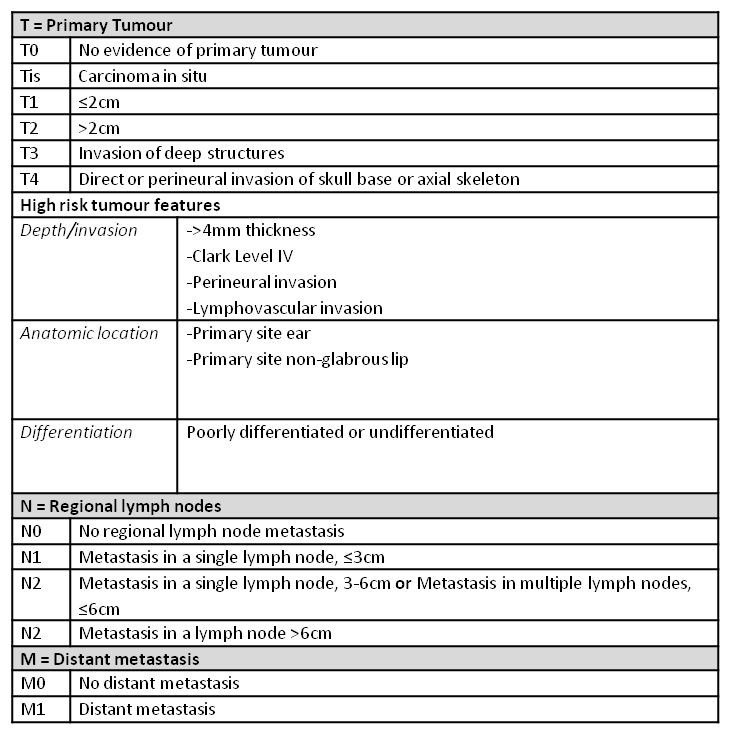 TNM Classification of Malignant Tumours (pp. 162-168). West Sussex, UK: Wiley-Blackwell. Lim, J.L, & Asgari, M. (2011). Clinical features and diagnosis of cutaneous squamous cell carcinoma. In: Basow, D.S. (Ed. ), UptoDate. Waltham, MA: UptoDate. ‍Chartier, T.K., & Stern, R.S. (2012). Treatment and prognosis of cutaneous squamous cell carcinoma. In: Basow, D.S. (Ed. ), UptoDate. Waltham, MA: UptoDate. Chartier, T.K., & Asai, S.Z. (2011). Treatment and prognosis of basal cell carcinoma. In: Basow, D.S. (Ed. ), UptoDate. Waltham, MA: UptoDate. Clarke, P. (2012). Nonmelanoma Skin Cancer: Treatment Options. Australian Family Physician, 41(7), 476-80. Retrieved from: http://www.racgp.org.au/afp/201207/47498. ‍BC Cancer Agency. Non-melanoma skin cancer management policies: Follow-up. Retrieved from: http://www.bccancer.bc.ca/HPI/CancerManagementGuidelines/Skin/NonMelanoma/ManagementPolicies/Followup.htm. Accessed July 30th, 2012.